It is well established that preterm birth (PTB) is an important public health concern in both developed and developing countries. A PTB is defined as a delivery before 37 weeks of gestation due to the onset of preterm labor. The incidence of PTB may vary across the globe and may depend on environmental factors and socioeconomic settings. Recently, World Health Organization (WHO) projected that each year approximately 15 million babies are born preterm and this number is increasing. PTB complications are the main cause of death among children below 5 years of age and was responsible for nearly 1 million deaths in 2013. Data from 184 countries suggested that the PTB rate ranges from 5% to 18% in different parts of the world. Further, WHO subcategories of PTB based upon gestational age are extremely preterm (<28 weeks); very preterm (28 to <32 weeks), and moderate-to-late preterm (32 to <37 weeks). It is estimated that more than 60% of PTBs occur in Africa and south Asia, and it is beyond doubt a global problem. The countries with the maximum PTB numbers are India – 3,519,100; China – 1,172,300; Nigeria – 773,600; Pakistan – 748,100; Indonesia – 675,700; United States – 517,400; Bangladesh – 424,100; Philippines – 348,900; Democratic Republic of the Congo – 341,400; and Brazil – 279,300. However, significantly high PTB rates (over 15%) are estimated from countries such as Malawi, Congo, Comoros, Zimbabwe, Equatorial Guinea, Mozambique, Gabon, Pakistan, Indonesia, Mauritania, and Botswana. The increase in the PTB rate can be linked to several factors. Most PTBs occur spontaneously, however, a proportion of such births is due to very early onset of labor and caesarean birth, either due to medical or nonmedical reasons. Common causes of PTB include multiple fetuses, intrauterine infections, hormonal deregulations, chronic conditions, i.e., diabetes and high blood pressure, and genetics. A better understanding of the mechanistic underpinnings for PTB will certainly lead to the development of better therapeutic options to prevent this dreaded pregnancy malady. Most of the reviews on PTB have focused on ascending infections and genetic causes, effectiveness of progestogen for prevention of PTB, and association of work and behavior with PTB. However, no comprehensive review is available that addresses the emerging data on the association of occupational and environmental exposures and lifestyle factors with PTB. The relevant literature was collected by searching numerous database, websites, and peer-reviewed journals, especially on occupational and reproductive health. The available data is compiled to describe the role of occupational, environmental, and lifestyle factors and their association with PTB. Data on occupational and environmental factors with respect to PTB are summarized in [Table 1], lifestyle issues in [Table 2], and physical factors/exposure in [Table 3]. The increasing risk of exposure to synthetic chemicals through bioaccumulation in the body and unpredictable contacts is slowly unraveling the facts regarding possible hazards to human and animal health. Although the awareness on the possible consequences to human health from synthetic substances has been raised during the past decades, an average of 2–3 new synthetic chemicals, whose effects are largely unknown, are introduced into the environment and food chain. There are approximately 70000 different synthetic chemicals in the global market, and many others are emitted as by-products of their production or disposal. Today, synthetic chemical contamination is pervasive and global. There is no clean, uncontaminated place and no person unscathed by this chemical legacy. The persistent nature in the environment and bioaccumulation of these chemicals raise the possibility of long-lasting harmful effects to environment and health. Some of these persistent environmental contaminants known as endocrine disruptors can obstruct the bioactivity of the body's own hormones and affect the reproductive health. A few environmental pollutants have been studied for their potential to enhance PTB risk. Because only limited information is available on the biological consequences of most of these pollutants, their potential role in programming of PTB is inadequately understood. Interestingly, some reasonable data are available on metals such as lead and environmental tobacco smoke (ETS), suggesting that maternal exposure to these pollutants increases the risk of PTB., In addition, a number of epidemiological studies have found a significant relationship between exposure to air pollutants and PTB, particularly sulfur dioxide and particulate matters. To add to this list, agricultural chemicals warrant greater attention as potential risk factors for PTB. A few studies have suggested that exposure to nitrates and arsenic through drinking water can be associated with PTB. Despite all these alarms for adverse pregnancy outcomes, a large number of pollutants to which a pregnant woman is exposed routinely have never been investigated for PTB. Thus, an efficient and effective research program is needed as women are exposed to a large number of potential toxicants. Earlier, Ahamed et al. studied women of reproductive age who were continually exposed to arsenic through drinking water. These women, 98% consuming drinking water containing ≥0.10 mg/L arsenic for a shorter period and about 43.8% had been drinking arsenic-contaminated water for 5–10 years, experienced adverse pregnancy outcomes including PTB. Adverse pregnancy outcomes such as spontaneous abortion, stillbirth, and PTB were considerably higher in the exposed group compared to the nonexposed group. Numerous studies have indicated that air pollutants influenced both male and female reproductive health. Since the mid-1990s, several studies have established a link between ambient air pollutants to adverse birth outcomes including low birth weight (LBW), small for gestational age (SGA), PTB, and cardiac birth defects. However, mechanism of air pollutants and adverse birth outcomes is poorly understood due to the lack of appropriate animal models and the inability to identify specific toxicants. Most work along these lines has been done for PAHs, however, other air toxicants such as metals and volatile organic compounds may also be important contributors to adverse reproductive health. Recently, DeFranco et al. also mentioned that high levels of particulate air pollutant, i.e., PM2.5 exposure during pregnancy is associated with elevated risk of PTB and greatest risk with third trimester exposure. This exposure may in part contribute to the higher PTB rates observed in Ohio compared to other states in the US. In addition to traffic source of pollutants, other PAH sources were also shown to be associated with increased incidence of PTB. Ferguson et al. examined a possible association between PTB and exposure to five groups of environmental toxicants, including persistent organic pollutants, drinking-water pollutants, atmospheric pollutants, metals and metalloids, and other unknown environmental pollutants. They reported that no consistent evidence was found for any association between individual chemical exposure and PTB. They also identified limitations of the approach and addressed the knowledge gaps. Noteworthy are the recent observations by Huang et al. who found a significant association between higher maternal urinary cadmium (Cd) levels and the risk of very LBW PTB. The association was more pronounced for female infant pregnancies than male infants' pregnancies. This study suggested that prenatal exposure to Cd at the current level encountered in China may potentially increase the risk of delivering preterm LBW infants. Recently, Yang et al. also found that an increase in Cd concentration in maternal urine was associated with decreased gestational age. This is further supported by the observations of Nishijo et al. who previously reported that maternal exposure to Cd contributed to early pregnancy delivery with LBW. They also mentioned that Cd is transferred intergenerationally through breast milk after birth. Other reports provide evidence for a significant role of lead in adverse pregnancy outcomes. Luisa et al. reported that intrauterine lead exposure may be associated with PTB in first delivery but not in subsequent ones. Recently, Zhang et al. found that mothers with preterm low-birth weight (PLBW) infants had higher levels of lead in urine with female fetuses' pregnancies. Taylor et al. also reported effects of maternal blood lead (B-Pb) on the incidence of preterm delivery, birth weight, head circumference, and crown–heel length. Earlier Savitz et al. mentioned that maternal occupational exposure to lead was strongly associated with PTB. Further, two-fold increased risk of preterm delivery (PTD) was found with paternal employment in the glass, clay, stone, textile, and mining industries. In addition, earlier reports by Lin et al. also suggested a relationship between paternal occupational lead exposure and LBW/prematurity. No statistically significant difference was found in birth weight or gestational age between the exposed and control groups. However, workers who had elevated blood lead levels for more than 5 years had a higher risk of fathering a child with LBW or prematurity. Further, Falcon et al. assessed the relationship of placental lead to intrauterine fetal growth and adverse pregnancy outcomes. They found higher lead levels in placentas from premature rupture of membranes and preterm labor (gestational age ≤37 weeks) compared to the placentas from term pregnancies. The proportion of abnormal pregnancy outcome in patients of placentas with lead concentrations more than 120 ng/g was 40.6 versus 8.8% in placentas lower with this concentration. Quansah and Jaakkola reported that maternal exposure to welding fumes (WF) or metal dusts or fumes (MD/F) combination during pregnancy may reduce the fetal growth and further stated that paternal exposure to WF may increase the risk of preterm delivery and small-for-gestational age. Some data are also available on insecticides, herbicides, etc., with respect to reproduction and its outcome. Recently, Rinsky et al. examined the relationship between PTB and exposure to a commonly used herbicide, atrazine. An increase in the odds of PTB was found among women living in counties with the highest levels of atrazine in drinking water group compared with women residing in counties with the lowest exposure. Earlier, Longnecker et al. reported that DDT use increased the risk of PTB. DeLong et al. reported premature pupping in sea lions observed since 1968. They found that organochlorine pesticides and polychlorinated biphenyl residues were 2–8 times higher in tissues of premature parturient females and pups than that in full-term parturient females and pups. Recently, Sharma et al. assessed the gene-environmental interaction between maternal organochlorine pesticides (OCPs) and CYP17 gene polymorphism with respect to the risk of PTB. They found considerably higher levels of α-HCH, β-HCH, and γ-HCH in maternal blood of PTB patients. They also observed a significant interaction between γ-HCH (≥50th percentile) and CYP17 A1A1 (wild type) genotype and concluded that elevated levels of OCPs along with wild type state of CYP17 gene (A1A1) in women may be an etiological factor in “idiopathic' PTB.” Further, Mustafa et al. reported that the interaction between high OCPs levels and polymorphism in CYP1A1m2 and GSTM1 null genotypes may increase the risk of PTB, thus, providing confirmation for a gene-environment interaction in pregnant women and PTB. Earlier Demendi et al. reported that the Bax gene was overexpressed in PTB, whereas expression of the Bcl-2 gene remained unchanged. These studies indicate that genetic deviation and its interaction with the environmental exposure may be the risk factor of PTB. Rowland et al. analyzed 1320 women who worked as dental assistants and recently conceived. Among these women, 32 women reported exposure to ethylene oxide. Among exposed women, the age-adjusted relative hazard of spontaneous abortion was 2.5 for PTB 2.7 and for postterm birth was 2.1. The estimated relative risk of any one of these undesirable outcomes among exposed women was 2.5 after adjusting age, nitrous oxide, and mercury amalgams prepared. Further, Wennborg et al. also reported a slightly elevated risk, specifically for pre and postterm births among women working with certain laboratory tasks such as working with solvents and bacteria. In addition, Jensen et al. found a positive association between the use of a combination of oral contraceptives and PTB for all exposure periods and combination of contraceptives containing the progestin norethisterone. Other types of hormonal contraception were normally not associated with PTB and none were associated with small for gestational age neonates. Earlier Chen et al. reported that the use of oral contraceptives near the time of conception may be associated with an increased risk of LBP and PTB. Behrman and Butler reported that some environmental pollutants such as lead and tobacco smoke, and air pollutants may contribute to the threat of PTB; however, most environmental pollutants have not been investigated. Hossain and Westerlund also reported that environmental factors such as smoking, video display terminals, anesthetic gases, antineoplastic drugs, and exposure to lead, selenium, inorganic mercury have been implicated in adverse pregnancy outcome, and smoking during pregnancy is the leading factor for adverse pregnancy outcomes. Similarly, air pollution, pesticide exposure, and stress have also been associated with LBW and PTD. Recently Brunet-Tran et al. reported that the PTB rate in US and industrialized countries has paralleled with industrial expansion, suggesting a role of industrial toxicants and pregnancy outcomes. Based upon experimental studies they also suggested that the preconception testicular health is also a critical determinant of pregnancy outcomes and recommended to examine the contribution of the males to pregnancy outcome. Earlier, Guillette and Moore reported that exposure to environmental factors, both in utero and neonatally, might dramatically affect adult fertility. Studies carried out among contaminant-exposed wildlife populations also suggest that a number of mechanisms contribute to alterations in gonadal growth, maturation of germ cells, fertilization and pregnancy, and the endocrine processes. Lifestyle factors may also play an imperative role in reproduction and its outcome. There are some reports on smoking, alcohol consumption, tobacco chewing, and adverse reproductive outcome. Windham et al. reported increased rate of LBW and small for gestational age with heavier maternal smoking (>10 cigarettes/day), as well as an increased risk for very preterm birth (<35 weeks). These associations were generally stronger among infants of older (≥30 years) than those of younger mothers. High ETS exposure (≥7 hours/day in nonsmokers) was moderately associated with LBW, PTB, and most strongly with very PTB. In addition to ETS, tobacco chewing may also have a role in reproductive impairments. Gupta and Sreevidya reported that smokeless tobacco use was associated with an average reduction of 105 g in birth weight and a reduction in gestational age of 6.2 days. The adjusted odds ratio for PTD (<37 weeks) was 1.4; for delivery before 32 weeks it was 4.9 and before 28 weeks it was 8.0. Recently, Khattar et al. (2013) from India reported that exposure to ETS during pregnancy is associated with LBW. Archana et al. studied the effect of pan masala (pan masala plain – PMP, containing areca nut as the major ingredient), and with tobacco (PMT) on pregnant mice. Animals were treated with PMP and PMT from gestation day (GD) 0, 6, and 14 up to lactation. Gestation length was shorter, which was significant in PMT from GD 0 treated group. Pups born to PMT-treated dams had significant LBW. Neonatal death and post-implantation loss was also observed in the pan masala-treated groups. The data point toward fetotoxic potential of pan masala, especially PMT. However, data on chewing mixture of tobacco and areca nut with respect to human PTB remain significant. Recently, Kumar mentioned that existing studies advocate that tobacco and areca nut chewing alone, collectively or with other constituents, had potential for reproductive toxicity. Use of smokeless tobacco, in any form, by pregnant women also had harmful effects on pregnancy and outcome. Hence, pregnant women should keep away from consumption of any combination containing areca nut and tobacco to save the pregnancy and outcome. In addition to tobacco, the risk of extreme PTD was also reported to be associated with alcohol use and similar in magnitude to other well-recognized risks. These findings advocate that prevention of alcohol use during pregnancy might significantly reduce the risk of PTD. In addition, Col-Araz reported that the habit of watching television and using mobile phones and computer by mothers did not demonstrate any relationship with birth weight. However, mothers who used mobile phones or computers excessively during pregnancy had significantly more deliveries before 37 weeks. In addition, very recently Martin et al. mentioned that diet quality during pregnancy is associated with PTB; thus, preconceptional and early prenatal dietary counseling promoting healthy dietary intake could improve pregnancy outcomes. In addition to habits, work posture practices of women might also have a role in PTB. Earlier, Henriksen et al. suggested that pregnant women must avoid long-standing and heavy lifting during the second and third trimester of pregnancy. However, results from epidemiological studies are indistinct. They reported that standing and walking at work through the second trimester may present a risk for PTD. These studies indicated that several factors, both exogenous and endogenous, might account for the PTB. Later Runge et al. studied 62803 pregnant women registered at the Danish National Birth Cohort from 1996 to 2002. They observed a dose–response relationship between the total daily load lifted by pregnant women and PTB. Further, lifting heavy loads (>20/kg) more than10 times/day was associated with PTB up to an OR of 2.03. Physically demanding work may significantly increase a woman's risk of PTB., Other occupational exposure significantly associated with PTB included prolonged standing, shift and night work, and high cumulative work fatigue score, whereas no significant association between long work hours and PTB. Earlier, Mishra et al. found the odd of PTD was increased for women who climbed stairs ≥10 times/day, and for women who engaged in walking and leisure time exercise in the first and second trimesters had a protective effect on PTD. Hegaard et al. also observed that moderate-to-heavy leisure time physical activity during pregnancy is associated with a significantly reduced risk of PTD. They also reported that women who practiced more than 1 type of sports had a significantly reduced risk of PTD. It is known fact that some exercise is beneficial to human health. Guendelman et al. reported that moderate exercise is associated with reduced PTD, especially for women with BMI above the normal range. Earlier, Juhl et al. also showed a reduced risk of PTB among women who engaged in some kind of exercise during pregnancy in comparison with nonexercisers, however, no dose–response relationship was seen. These findings do not indicate any adverse effects of exercise on the risk of PTB, and therefore, do not contradict current recommendations. There are few reports of physical violence by the intimate partner and reproductive outcome. Rachana et al. reported the prevalence of physical violence was found to be 21% in Saudi Arabia and were likely to be hospitalized antenatally for maternal complications, i.e., trauma due to blows/kicks on the abdomen, preterm labor, abruptio-placenta, and kidney infections. There was a positive association between physical violence during pregnancy and cesarean section, abruptio-placenta, fetal distress, and prematurity. Later, Devries et al. reported that the prevalence of intimate partner violence (IPV) during pregnancy ranged from approximately 2.0% in Australia, Cambodia, Denmark, and the Philippines to 13.5% in Uganda. Prevalence appeared to be higher in African and Latin American countries compared to the European and Asian countries surveyed. Further, Rodrigues et al. found an association between physical abuse and PTD when abuse occurred only before pregnancy. The experience of violence before pregnancy may result in posttraumatic stress, which may lead to PTD. Furthermore, in addition to adverse effect on auditory function, excessive noise may also affect other organ systems including pregnancy outcome. However, sufficient data are not available on noise pollution and PTB. Recently Ristovska et al. reported an association between occupational noise exposure and LBW, PTB, and small for gestational age, either independently or together with other occupational risk factors. There are ample differences in the incidence of PTB in various parts of the world. Social status also plays a role in PTB. Recently, Carmichael et al. examined the capability of social, demographic, environmental, and health-related factors to understand the geographic variability in PTD among black and white women in the US. Much of the geographic variability in PTD can be elucidated by socioeconomic, demographic, and health-related characteristics of the population, but less so for blacks than whites. Basco et al. mentioned that low social status is a suspected risk indicator for PTB and also found that social decline and move to an urban municipality may be associated with PTB in Denmark. This may be due to poor hygienic settings and multiple partners leading to infections. Environmental exposure, oxidative stress, and PTB. In addition, induction of oxidative stress (OS) due to environmental, occupational, and lifestyles factors in reproductive tissues and organs may also have an impact upon reproduction and pregnancy outcome. Ahamed et al. elucidated the possible free radical-mediated mechanism of PTD with respect to lead exposure. A significantly higher placental lead and thiobarbituric acid reactive substances (TBARS) and significantly lower GSH level was observed in the group with PTD. Activity of antioxidant enzymes such as SOD, CAT, GPx, and GR were also significantly elevated in the placenta of women with PTD. Furthermore, placental lead has significant positive correlations with TBARS, SOD, and CAT, and negative correlation with GSH. There may be several possible reasons for increased OS in PTD. They pointed out that lead-induced OS may be one of the underlying mechanism(s) of PTD. Recently, Karakis et al. assessed an association between prenatal exposures to (semi-) metals and neonatal morbidity by introducing an OS as a possible intermediate step. An OS was measured by cell proliferation (CP) ratio in umbilical cord blood cells. Urine samples of 31% of 58 enrolled women were positive for (semi-) metals; 25.9% of women were positive for aluminum (Al). They found that CP ratio was higher (1) in patients with Al, (2) in mothers to newborns diagnosed as small-for-gestational age, (3) neonates that weighed less, and (4) in women who experienced repeated abortions. These findings suggest the possibility of metal-induced OS behind the cause of adverse reproductive outcome. Hong et al. investigated whether exposure to environmental chemicals, such as PAHs, volatile organic compounds, bisphenol A, or phthalates, stimulate OS in urban populations. They measured urinary levels of 1-hydroxypyrene, 2-naphthol, hippuric acid, methylhippuric acid, mono-(2-ethyl-5-hydroxyhexyl) phthalate, mono-(2-ethyl-5-oxohexyl) phthalate, and mono-butyl phthalate, and bisphenol A to assess environmental exposure. They also measured urinary malondialdehyde and 8-hydroxydeoxyguanosine to evaluate OS and found significant dose–response relationship between urinary concentrations of chemical exposure biomarkers and OS levels. Very recently, Ferguson et al. concluded that urinary phthalate metabolites were associated with increased OS biomarkers in pregnant women. These relationships might be relevant to birth outcomes linked to phthalate exposure. Weber et al. examined the relationship between neonatal outcome (BW, head circumference, SGA, PTD) with markers of OS and micronutrients in maternal and cord blood. Oxidative stress markers (protein carbonyls (PrCarb), 3-nitrotyrosine (3NT), malondialdehyde (MDA), total protein concentration, and lipid-soluble micronutrients (carotenoids, retinol, tocopherols) were estimated in newborns (11% preterm, 13% SGA) and mothers. They mentioned that prematurely borne neonates had lower proteins and retinol level but higher PrCarb than those born at term. Maternal PrCarb and retinol were inversely related with BW and head circumference. Mothers with PrCarb, MDA, and retinol with the highest quintile had a 3.3-fold, 2.1-fold and 3.3-fold risk, respectively, for delivering an SGA newborn, whereas the lowest quintile of retinol in cord blood was linked with an elevated risk for PTD. Recently, Al-Gubory also reported that there is ample evidence that the toxicological mechanisms of synthetic chemicals and unhealthy lifestyle involve in the generation of reactive oxygen species (ROS) and cellular oxidative damage. The studies available point out that environmental chemical exposure induces OS. Ferguson et al. reported that women exposed to phthalates during pregnancy have significantly elevated odds of delivering preterm. Hence steps should be taken to reduce maternal exposure to phthalates during pregnancy. Meeker et al. provided evidence for potential role for phthalate exposure (DBP, DOP, DEHP, and/or BBzP) in PTB among Mexican women. Later Huang et al. from China reported that prenatal exposure to phthalates is associated with younger gestational age and PTD. They also mentioned that phthalate exposure may adversely affect fetal growth parameters via gestational age reduction and PTD. Polanska et al. also reported that phthalate exposure may be associated with shorter pregnancy duration and a decreased head circumference, underscoring the importance of public health interventions. Recently, Marie et al. reviewed the literature on what phthalate metabolites are involved in PTB and highlighted an increased risk of PTB. The main metabolites detected and involved were primary metabolites of di-2 (ethylhexyl)-phthalate (DEHP) and di-n-butyl-phthalate (DnBP). The overall available data on phthalates and PTB suggests that some of the phthalates, such as DEHP and DBP, have the potential to induce PTB, which might be due to the OS induced by the phthalates. More studies warranted on other phthalates and those are also used in place of these phthalates. Ferguson et. al. linked exposure to phthalate during pregnancy and to adverse birth outcomes such as PTB, inflammation, and OS may mediate these relationships. They assessed the associations between urinary phthalate metabolites and biomarkers of inflammation, including C-reactive protein, various interleukin such as IL-1β, IL-6, IL-10 and TNF-α and OS, including 8-hydroxydeoxyguanosine and 8-isoprostane. Metabolites of DEHP were found to be associated nonsignificantly with increased level of IL-6 and IL-10. All phthalates were found to be associated with increases in OS markers. Relationship with 8-OHdG were significant for DEHP metabolites as well as mono-n-butyl phthalate and mono-iso- butyl phthalate. For 8-isoprostane, relationships with nearly all phthalates were statistically significant. Earlier Taylor et al. reported that elevated IL-6 in vaginal fluid displayed the strongest relationship with spontaneous preterm delivery <35 weeks and PTD with histologic chorioamnionitis (HCA). The sensitivity of IL-6 to detect spontaneous PTD or PTD with HCA was found to be 0.43 and 0.51, respectively. They found that IL-6 plus IL1β, IL-6, TNF-α, or granulocyte-macrophage colony-stimulating factor elevated specificity, but decreased sensitivity to detect both PTD subtypes. They further reported that multiple biomarkers did not detect PTD subtypes with a greater sensitivity than IL-6 alone and IL-6 is a specific but nonsensitive marker for the detection of spontaneous PTD. Ferguson et al. also reported that IL-6 was associated with increased odds of spontaneous PTB, defined by presentation of spontaneous preterm labor and/or preterm premature rupture of the membranes. IL-10 was associated with elevated odds of placentally mediated PTB, defined by presentation with preeclampsia or intrauterine growth restriction, and odds ratios were also the highest near the end of pregnancy. In addition, neurohormones may also have some role in PTB. Petraglia et al. reported that oxytocin (OT) is the neurohormone whose main target is uterine contractility, and the placenta represents a novel source that contributes to the mechanisms of parturition. They also reported that CRH/urocortin (Ucn) family is another significant neuroendocrine pathway implicated in term and PTB. A preterm birth indication is a premature activation of OT secretion and elevated maternal plasma CRH levels imply a pathogenic role of these neurohormones. A decline of maternal serum CRH-binding protein is a simultaneous event. At mid-gestation, placental hypersecretion of CRH or Ucn has been projected as a extrapolative marker of successive PTD. The complex mechanisms controlling parturition involve mother, fetus, placenta, and stress is a key factor activating a series of physiological responses. In addition, physical environmental/occupational factors such as excessive temperature may also have role in PTB. Recently Carolan-Olah and Frankowska reviewed the data on high environmental temperature and PTB and reported that the weight of evidence supported an association between high environmental temperature and PTB. However, the degree of association varied significantly. Differing definitions of PTB may also add to the lack of clarity. Strand et al. found a strong association between higher temperature and increased risk of still birth and shorter gestation. Based on these, pregnant women are advised to take precautions to avoid heat stress when sudden elevation of temperature occurs. There is now new awareness about the role of environmental, lifestyle, and occupational factors behind the increasing trend for reproductive disorders in both male and female reproductive health. There are reports which indicated that certain environmental chemicals may have adverse effects on human reproduction and may also be associated with PTB. Thus, there is a need to understand the problem with respect to environmental and occupational exposure, as well as suggest or facilitate planning for interventions in PTB. There are several questions which could be answered by future studies, such as certain chemicals or their metabolite in the seminal plasma and/or placental tissue, may compromise the quality of gametes, which may become a risk factor for reproductive outcome and PTB and also on the role of testicular health and PTB. Based on available information even though inconclusive, it is advised to reduce the exposure to these chemicals those reported to have adverse reproductive/pregnancy outcome. These persistent chemicals, lifestyle factors, physical and social factors, environment may induce oxidative stress; these increased oxidative stresses might be a cause behind the idiopathic adverse pregnancy outcome. Hence, it is advisable that pregnant women prevent the exposure to such factors. WHO, Preterm Birth. Updated. Fact sheet N 363, November 2016 http://www.who.int/media centre/factsheets/fs363/en/. [Last accessed on 2016 Oct 13]. WHO, Born too soon. The global action report on pre-term birth. 2012 http://apps.who.int/iris/handle/10665/44864. [Last accessed 2016 Jul 20]. Marie C, Lemery D, Vendittelli F, Sauvant-Rochat MP. What phthalate metabolites are involved in the risk of preterm birth? A review. Eur J Public Health 2015;25:309. Meeker JD, Hu H, Cantonwine DE, Lamadrid-Figueroa H, Calafat AM, Ettinger AS, et al. Urinary Phthalate metabolites in relation to preterm birth in Mexico City. Environ Health Pers 2009;117:1587-92. Huang Y, Li J, Garcia JM, Lin H, Wang Y, Yan P, et al. Phthalate exposure in cord blood are associated with preterm delivery and fetal growth parameters in Chinese women. PLoS One 2014;9:e87430. Polanska K, Ligocka D, Sobala W, Hanke W. Effect of environmental phthalate exposure on pregnancy duration and birth outcomes. Int J Occup Med Environ Health 2016;29:683-97. Longnecker MP, Klebanoff MA, Zhou H, Brock JW. Association between maternal serum concentration of the DDT metabolite DDE and pre-term and small for gestation age babies at birth. Lancet 2001;358:110-4. Wilhelm M, Ghosh JK, Jason Su, Cockburn M, Jerrett M, Ritz B. Traffic-related air toxics and preterm birth: A population-based case-control study in Los Angeles County, California. Environ Health 2011;10:89. DeFranco E, Moravec W, Xu F, Hall E, Hossain M, Haynes EN, et al. Exposure to airborne particulate matter during pregnancy is associated with preterm birth: A population-based cohort study. Environ Health 2016;15:6. Ahamed M, Mehrotra PK, Kumar P, Siddiqui MK. Placental lead-induced oxidative stress and preterm delivery. Environ Toxicol Pharmacol 2009;27:70-4. Mustafa MD, Banerjee BD, Ahmed RS, Tripathy AK, Guleria K. Gene-environment interaction in preterm delivery with special reference to organochlorine pesticides. Mol Hum Reprod 2013;19:35-42. Sharma T, Banerjee BD, Mustafa M, Guleria K, Ahmed RS, Tripathi AK. Gene environment interaction in preterm delivery with special reference to organochlorine pesticide: A case control study. Int J Biochem Mol Biol 2013;4:209-14. Rowland AS, Baird DD, Shore DL, Darden B, Wilcox AJ. Ethylene oxide exposure may increase the risk of spontaneous abortion, preterm birth, and post-term birth. Epidemiology 1996;7:363-8. Ahmad SA, Sayed MH, Barua S, Khan MH, Faruquee MH, Jalil A, et al. Arsenic in drinking water and pregnancy outcomes. Environ Health Persp 2001;109:629-31. Wennborg H, Bonde JP, Stenbeck M, Olsen J. Adverse reproduction outcomes among employees working in biomedical research laboratories. Scand J Work Environ Health 2002;28:5-11. Huang K, Li H, Zhang B, Zheng T, Li Y, Zhou A, et al. Prenatal cadmium exposure and preterm low birth weight in China. J Expo Sci Environ Epidemiol 2016. Yang J, Huo W, Zhang B, Zheng T, Li Y, Pan X, et al. Maternal urinary cadmium concentrations in relation to preterm birth in the Healthy Baby Cohort Study in China. Environ Int 2016;94:300-6. Nishijo M, Nakagawa H, Honda R, Tanebe K, Saito S, Teranishi H, et al. Effects of maternal exposure to cadmium on pregnancy outcome and breast milk. Occup Environ Med 2002;59:394-6. Rinsky JL, Hopenhayn C, Golla V, Browning S, Bush HM. Atrazine exposure in public drinking water and preterm birth. Public Health Rep 2012,127:72-80. Torres-Sánchez LE, Berkowitz G, López-Carrillo L, Torres-Arreola L, Ríos C, López-Cervantes M. Intrauterine Lead Exposure and Preterm Birth. Environ Res 1999;81:297-301. Zhang B, Xia W, Li Yuanyuan, Bassiq BA, Zhou A, Wang Y, et al. Prenatal exposure to lead in relation to risk of preterm low birth weight: A matched case–control study in China. Reprod Toxicol 2015;57:190-5. Taylor CM, Golding J, Emond AM. Adverse effects of maternal lead levels on birth outcomes in the ALSPAC study: A prospective birth cohort study. BJOG 2014;122:322-8. Falcon M, Vinas P, Luna A. Placental lead and outcome of pregnancy. Toxicology 2003;185:59-66. Gupta PC, Subramoney S. Smokeless tobacco use, birth weight, and gestational age: Population based, prospective cohort study of 1217 women in Mumbai, India. BMJ 2004;328:1538. Windham GC, Hopkins B, Fenster L, Swan SH. Prenatal active or passive tobacco smokes exposure and the risk of preterm delivery or low birth weight. Epidemiology 2000;11:427-33. Sokol RJ, Janisse JJ, Louis JM, Baile BN, Ager J, Sandra WJ. Extreme Prematurity: An Alcohol-Related Birth Effect. Alcoholism Clin Exp Res 2007;31:1031-7. Guendelman S, Pearl M, Kosa Jessica L, Graham S, Abrams B, Kharrazi M. Association between preterm delivery and pre-pregnancy body mass (BMI), exercise and sleep during pregnancy among working women in southern California. Matern Child Health J 2012;17:723-31. Juhl M, Andersen PK, Olsen J, Madsen M, Jørgensen T, Nøhr EA, et al. Physical exercise during pregnancy and the risk of preterm birth: A study within the Danish National Birth Cohort. Am J Epidemiol 2008;167:859-66. Runge SB, Pedersen JK, Svendsen SW, Juhl M, Bonde JP, Andersen AN. Occupational lifting of heavy loads and preterm birth: A study within the Danish National Birth Cohort. Occup Environ Med 2013;70:782-8. Henriksen TB, Hedegaard M, Secher NJ, Wilcox AJ. Standing at work and preterm delivery. Br J Obstet Gynaecol 1995;102:198-206. Petraglia F, Imperatore A, Challis John RG. Neuroendocrine mechanisms in pregnancy and parturition. Endocr Rev 2013;31:783-816. Carolan-Olah M, Frankowska D. High environmental temperature and preterm birth: A review of the evidence. Midwifery 2014;30:50-9. Rachana C, Suraiya K, Hisham AS, Abdulaziz AM, Hai A. Prevalence and complications of physical violence during pregnancy. Eur J Obstet Gynecol Reprod Biol 2002;103:26-9. Rodrigues TA, Rocha LP, Barros HP. 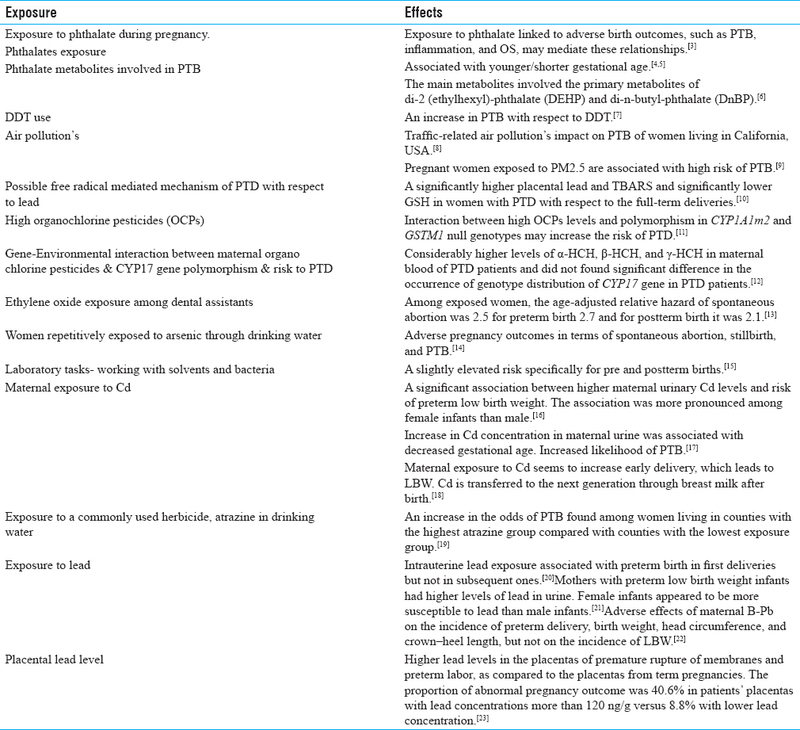 Physical abuse during pregnancy and preterm delivery. Am J Obstet Gynecol 2008;198:171. Ristovska G, Elvira LH, Hansell L. Reproductive outcomes associated with noise exposure - A systematic review of the literature. Int J Environ Res Public Health 2014;11:7931-52. WIT's World Ecology Report - 1997; 09, No. 16 page. Health & Environment: Effect of High-risk Synthetic Chemicals. http://collections. Info collections. org/ukedu/en/d/Jwit 23e/6.html. [Last accessed 2016 Jul 22]. Behrman RE, Butler AS. Preterm Birth: Causes, Consequences, and Prevention. Washington DC, USA: National Academies Press; 2007. Joffe M. Infertility and environmental pollutants. Br Med Bull 2003;68:47-70. Ahluwalia IB, Grummer-Strawn L, Scanlon KS. Exposure to environmental tobacco smoke and birth outcome: Increased effects on pregnant women aged 30 years or older. Am J Epidemiol 1997;146:42-7. Ritz B, Wilhelm M. Ambient air pollution and adverse birth outcomes: Methodological issues in an emerging field. Basic Clin Pharmacol Toxicol 2008;102:182-90. Ferguson KK, O'Neill MS, Meeker JD. Environmental contaminant exposures and preterm birth: A comprehensive review. J Toxicol Environ Health B Crit Rev 2013;16:69-113. Savitz DA, Whelan EA, Kleckner RC. Effect of parents' occupational exposures on risk of stillbirth, preterm delivery, and small-for gestational-age infants. Am J Epidemiol 1989;129:1201-18. Lin S, Hwang SA, Marshall EG, Marion D. Does Paternal Occupational Lead Exposure Increase the Risks of Low Birth Weight or Prematurity? Am J Epidemiol 1998;148:173-81. Quansah R, Jaakkola JJ. Paternal and maternal exposure to welding fumes and metal dusts or fumes and adverse pregnancy outcomes. Int Arch Occup Environ Health 2009;82:529-37. DeLong RL, Gilmartin WG, Simpson JG. Premature births in California Sea lions: Association with high organo-chlorine pollutant residue levels. Science 1973;181:1168-70. Demendi C, Borzsonyi B, Vegh V, Nagy ZB, Rigo J Jr, Pajor A, et al. Gene expression patterns of the Bcl-2 and Bax genes in preterm birth. Acta Obstet Gynecol Scand 2012;91:1212-7. Jensen T, Daniels JL, Stürmer T, Robinson WR, Williams CJ, Vejrup K. Hormonal contraceptive use before and after conception in relation to preterm birth and small for gestational age: An observational cohort study. BJOG 2015;122:1349-61. Chen XK, Wen SW, Sun LM, Yang Q, Walker MC, Krewski D. Recent oral contraceptive use and adverse birth outcomes. Eur J Obstet Gynecol Reprod Biol 2009;144:40-3. Hossain N, Triche EW. Environmental factors implicated in the causation of adverse pregnancy outcome. Semin Perinatol 2007;31:240-2. Bruner-Tran KL, Ding T, Yeoman KB, Archibong A, Arosh JA, Osteen KG. Developmental Exposure of Mice to Dioxin Promotes Transgenerational Testicular Inflammation and an Increased Risk of Preterm Birth in Unexposed Mating Partners. PLoS One 2014;9. Guillette LJ, Moore BC. Environmental contaminants, fertility, and multioocytic follicles: A lesson from wildlife? Semin Reprod Med 2006;24:134-41. Kumar S. Tobacco and areca nut chewing--reproductive impairments: An overview. Reprod Toxicol 2013;36:12-7. Col-Araz N. Evaluation of factors affecting birth weight and preterm birth in southern Turkey. J Pak Med Assoc 2013;63:459-62. Martin CL, Stores-Alvarez D, Sieqa-Riz AM. Maternal dietary patterns during the second trimester are associated with preterm birth. J Nutr 2015;145:1857-64. Mozurkewich EL, Luke B, Avni M, Wolf FM. Working conditions and adverse pregnancy outcome: A meta-analysis. Obstet Gynecol 2000;95:623-35.
van Beukering MD, van Melick MJ, Mol BW, Frings-Dresen MH, Hulshof CT. Physically demanding work and preterm delivery: A systematic review and meta-analysis. Int Arch Occup Environ Health 2014;87:809-34. Mishra DP, Strobino DM, Stashinko EE, Nagey DA, Nanda J. Effects of physical activity on preterm birth. Am J Epidemiol 1898;147:628-35. Hegaard HK, Hedegaard M, Damm P, Ottesen B, Petersson K, Henriksen TB. Leisure time physical activity is associated with a reduced risk of preterm delivery. Am J Obstet Gynecol 2008;198:180. Devries KM, Kishor S, Johnson H, Stockl H, Bacchus LJ, Garcia-Moreno C, et al. Intimate partner violence during pregnancy: Analysis of prevalence data from 19 countries. Reprod Health Matters 2010;18:158-70. Carmichael SL, Cullen MR, Mayo JA, Gould JB, Loftus P, Stevenson DK. Population-Level Correlates of Preterm Delivery among Black and White Women in the U.S. PLoS One 2014;9:e94153. Basso O, Olsen J, Christensen K. Study of environmental, social and paternal factors in preterm delivery using sibs and half sibs. A population-based study in Denmark. J Epidemiol Community Health 1999;53:20-3. Karakis I, Sarov B, Landau D, Manor E, Yitshak-Sade M, Rotenberg M, et al. Association between prenatal exposure to metals and neonatal morbidity. J Toxicol Environ Health 2014;77:1281-4. Hong YC, Park EY, Park MS, Ko JA, Oh SY, Kim H, et al. Community level exposure to chemicals and oxidative stress in adult population. Toxicol Lett 2009;184:139-44. Ferguson KK, McElrath TF, Chen YH, Mukherjee B, Meeker JD. Urinary phthalate metabolites and biomarkers of oxidative stress in pregnant women: A repeated measures analysis. Environ Health Perspect 2015;123:210-6. Weber D, Stuetz W, Bernhard W, Franz A, Raith M, Grune T, et al. Oxidative stress markers and micronutrients in maternal and cord blood in relation to neonatal outcome. Eur J Clin Nutr 2014;68:215-22. Al-Gubory KH. Environmental pollutants and lifestyle factors induce oxidative stress and poor prenatal development. Reprod Biomed Online 2014;29:17-31. Ferguson KK, McElrath TF, Meeker JD. Environmental phthalate exposure and preterm birth. JAMA Pediatr 2014;168:61-7. Ferguson KK, Cantonwine DE, Rivera-González LO, Loch-Caruso R, Mukherjee B, Anzalota Del Toro LV, et al. Urinary phthalate metabolite associations with biomarkers of inflammation and oxidative stress across pregnancy in Puerto Rico. Environ Sci Techno 2014;48:7018-25. Taylor BD, Holzman CB, Fichorova RN, Tian Y, Jones NM, Fu W. Inflammation biomarkers in vaginal fluid and preterm delivery. Hum. Reprod 2013;28:942-52. Ferguson KK, McElrath TF, Chen YH, Mukherjee B, Meeker JD. Longitudinal profiling of inflammatory Cytokines and C-reactive protein during uncomplicated and preterm pregnancy. Am J Reprod Immunol 2014;72:326-36. Strand LB, Barnett AG, Tong S. Maternal exposure to ambient temperature and risk of preterm birth and stillbirth in Brisbane, Australia. Am J Epidemiol 2012;175:99-107.